Vakatu riding atop his mighty steed Krukoa. The moc is getting a slight reworking after its last two conventions. Krukoa is currently undergoing a body reconstruction. I am trimming up the model, and trying to go for the look that I originally indended for the MOC. Pretty cool. really, really messy though. it is hard to see what is what. O_O MIND = BLOWN. EPIC DUDE! I want one. Scratch that, I want seven. 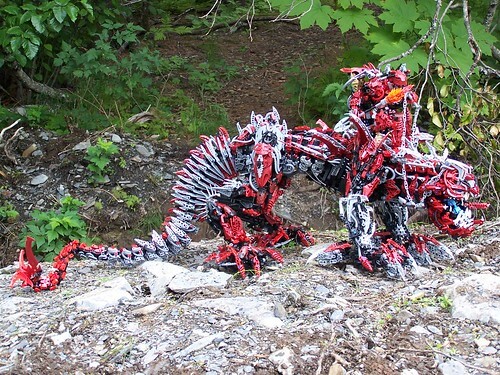 wonder what it would look like if you used peices from every bionicle set??? I know its been a while since you made this moc and I was wondering if you still have it. Would you be willing to every sell it? And at what price? Now this is true epicness! You are one of the builders that I aspire to become as good as one day! I don't find any words. Stunning. This looks like devastator with only red, no green, yellow, etc. Good build, but i can't really see much detail, more of blob-ish pictures. wow dude your the best bioncle maker ive never seen such brillance. wow!! that is the most awemazom bionicle ive ever seen, ur awesome, u should look at some of my creations maybe we could help each other out? honestly, do you expect us to beleive YOU ARE NOT A GOD!?! THIS IS CRAZY AWESOME COOL MOC! I THINK THIS IS THE BEST MOC I EVER SAW!!!!! NO JOKE! Dang! It's huge! Massive! Epic! This is absulutly amazing u r the best,you should make instructions lol. dude thats just amazinly huge! I love this and OMG!!! Your Roa Mc Toa from Bzp Power! I love your work espicially the Suvika and their Rahi!! Your Great! Your works continue to amaze me, Roa. The head is stunning, you have really captured the twisted bestial look. The tail is also very impressive, it looks quite realistic. The legs look rather thick, I don't know if that's good or bad, because it looks kind of funny in some angles, and it looks threatning and robust in others. I'm working on a Giant Rahi myself currently, so I've realized that it is pretty hard to get the legs stable. If I only knew how... >.< One final question: Is this the last Giant Rahi that you'll make, or will there be wild ones too? Fascinating. I have never seen something as large and detailed as this. This is beyond what I thought was possible with Bionicle. I guess if you have thousands and thousands of parts it's a whole different level. My kudos! HOLY! HOW BIG IS THAT THING! 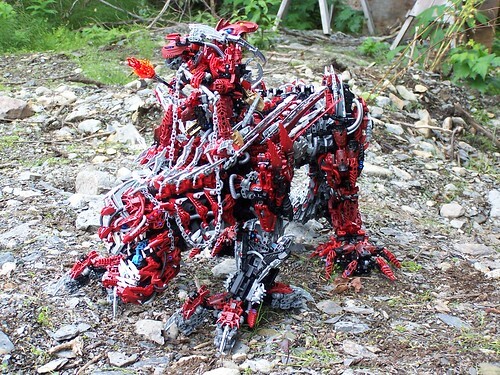 That is the most detailed bionicle I've ever seen! Do you know how many pieces that has in it? 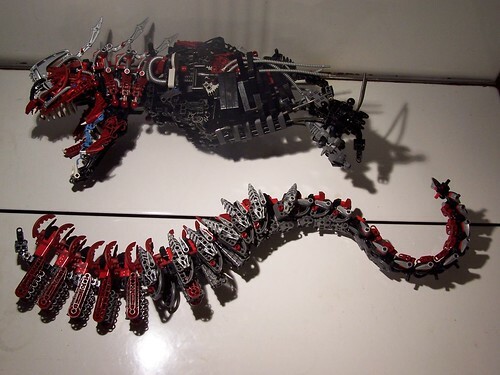 Well,i aways liked this MOC,but never commented on him.And the only thing i have to say about it is this:The best bionicle MOC ever maded!Cant whait to see his next version!Oh and,check out my MOCs,if you can. Amazing! I also checked your brickshelf and it's breath taking! But, It's sad that this giant creation has got just 25 comments! 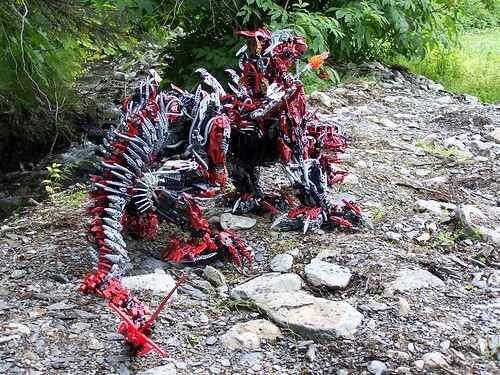 Whoa, now that I know what can be done with Bionicle, I REALLY need to put my hands on more pieces.... You're a genius. I keep all my mocs built. I have a lot of parts, and am never in short supply. I do collect Bionicle sets. Its nice to have all the latest parts, but in the end after I am bored of the set, parts is what it all boils down to. This is... amazing! I've seen your MOcs before, and I think thei're the best I've ever seen... Now, just some questions: do you have all of your MOcs builded, or you unmake them so you can build others(like me)? Oh, and do you actually collect Lego or buy it just for the pieces? Ok. thanks for you help! I usually start with a head on a beast like this. I build them starting from the mouth, building till I reach the end of the tail. I am thinking of trying a new technique for building strong, light weight bodies that would work well for this moc. this is excellent I'm sure you've heard that millions of times and i know it definantally deserves that. only question how do you make this? i mean do you just start with a base and go on from what you think looks cool (like me)or do you follow instructions made by yourself? I built this rahi primariy out of 22 Vezon and Fenrakk kits of which I bought on clearance :)Many parts came randomly from my large collection, and Bryce (Cajun) sent me a few parts that I didn't have, like the red swords, horse helmets and a bunch of other red pieces.I worked on it over about 2 months with a rather large building break between start and finish. 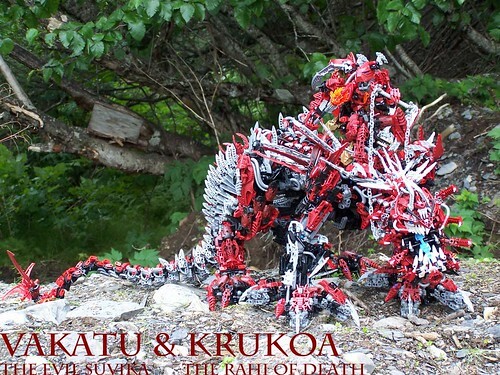 I like it, how many BIONICLE sets did you use for it? zomg, its truly amazin! awesome job!